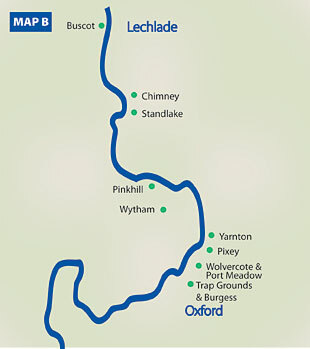 From Lechlade to North Oxford, the Thames is a river running through open country. There are few riverside houses, as the villages were built away from fields that are liable to flood in winter. Osney Bridge in Oxford restricts the size of boats, so this upper Thames is often quiet. The grass banks, reeds and willows create a tranquil scene. You are as likely to hear a buzzard’s mewing call as a plane coming in to land at Brize Norton. The Thames Path is often muddy in winter, but gives good views of the river for most of the way. The exception is where the Thames Path veers away from the old towpath between Pinkhill and Bablockhythe, where once there was a ferry. 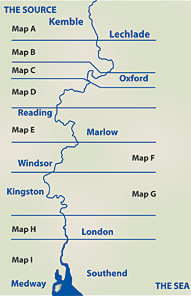 Chimney reserve has the most notable group of meadows in this section, while Yarnton, Oxey and Pixey Meads have names that show their ancient history. Pinkhill, by Farmoor reservoir, is popular with bird-watchers. Buscot is part of a large National Trust estate.